Stephen Jay loves playing bass for parodist "Weird Al" Yankovic, an occupation he's had since 1981. As a member of Al's full-time band, he's appeared on all nine of the Weird One's albums, the latest being Running with Scissors [Volcano]. But the gig is only part of his busy professional life. When he's not on the road with Yankovic, Stephen can be found in his Southern California studio composing scores for feature films, PBS shows, industrial videos, commercials, and public service announcements. He's also done extensive session work, released three solo records on his own Ayarou label, and produced two albums for the WEA Nonesuch Explorer series using his field recordings of traditional West African music. A native Floridian, Stephen graduated from the University of South Florida in 1972, earning a Master's degree in composition. He then took off for Niger, where for two-and-a-half years he studied drumming with hereditary musicians called griots. Weakened by malaria and intestinal parasites, he eventually had to return to the States. Following a failed Frank Zappa audition Stephen relocated to Los Angeles and hooked up with Weird Al. He continued to travel, studying folk music and collecting wind, string, and percussion instruments from Asia and the South Pacific. Jay developed his prodigious bass technique simply because playing is so much fun. "My main way to practice is to compose. If music is like architecture, then bass and drums are the foundation, the perfect place to start. Being a bassist lets me understand as a composer how things go from the beginning, as opposed to starting with chords and a melody and adding a bass part as accompaniment. "On the other hand, being a composer makes me try to innovate as a bassist. One thing that hasn't been done much is to use the bass as a rhythmic exoskeleton that surrounds the music rather than sustaining it like a spine. In my own work I like to jump from being the spine to having a much more active part, almost like a bluegrass line. In a lot of my tunes you can hear the bass go to the music's perimeters without focusing itself on one melodic part. I'll give it a lot of melodic parts built into a complex funk arrangement. I sometimes try to create funk grooves based on African polyrhythms, where you can feel the three against the four back there, giving a nice triangulation effect on the syncopation." Stephen has also developed what he calls the Theory of Harmonic Rhythm, in which he posits that harmony may be converted into rhythm and vice versa. He believes this theory may help composers line up rhythmic and harmonic intervals to produce more cohesive and symmetrical music. 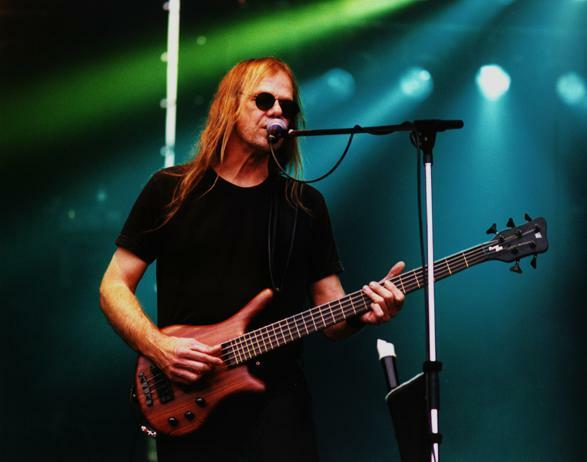 Stephen's main instrument is a custom Alembic 4-string similar to the Stanley Clarke Signature Deluxe; he also owns basses by Ken Smith, Fender, Guild, Warwick, and Martin. With a 30e" scale, the ziricote-wood Alembic has an extremely narrow neck. Stephen's effects are a Korg AX40B Toneworks floor unit and an Alembic SF-2 Superfilter. For amplification he runs a MESA/Boogie D-180 head into a MESA/Boogie 2x15B cab. He considers correct volume the key to good tone, so he monitors with a MESA/Boogie Wedge 2x10B powered by an Alesis R-100 stereo power amp. Why doesn't a critically acclaimed composer/multi-instrumentalist balk at providing note-for-note copies of pop songs for someone called "Weird Al"? "With Al, we don't take the music as a joke. When he's doing his funny lyrics, I don't even hear it. We're delivering notes from these genius composers who have written these hits that we parody?it's just a fantastic position to be in as a musician. I take it as seriously as I do my own music. The interval between the band's super-serious attitude and Al's crazy antics is what gives it tension and makes it so entertaining and successful. Anyway, I'm a firm believer that music is for people. Without an audience it doesn't mean much." Look for Stephen Jay's solo albums at www.amazon.com; visit www.stephenjay.com for more about his Theory of Harmonic Rhythm.